Benedict XVI has made important gestures towards China and its Church. But even now the Beijing government demands ultimate power over faithful and bishops. The Vatican dicasteries, overly concerned with compromise, failed to sufficiently support the pope’s line of courage, truth and openness. The Party in danger of collapse due to widespread corruption. The Church in China is rescued by the many faithful, willing to accept suffering, but unwilling to abandon the faith. 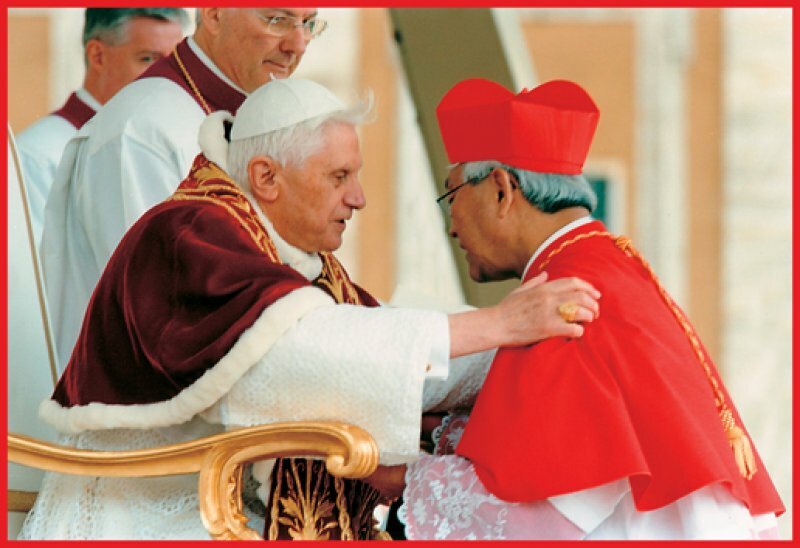 The new pope has to start from Pope Benedict XVI’s Letter to Chinese Catholics. Card. Zen is traveling to Italy. February 27 next he will be at the last general audience of Pope Benedict XVI. Hong Kong (AsiaNews) - Benedict XVI is a great Pope, a man in love with the truth. For him, God is truth, and man can not live without truth. Unfortunately, today the truth is not "fashionable" and what really dominates it what Benedict XVI has termed "the dictatorship of relativism." But he has always held the helm on a straight course according to the truth. This has been his contribution to world culture and also to China. It must be added this Pope has done things for China that he has not done for any other country: to no other particular Church has he written a specific letter, no country has a special Commission dedicated to it of about 30 members, from the two most important dicasteries in the Holy See. We should be profoundly grateful to him for this. But unfortunately I have to add that often he was a lonely voice in the wilderness. I have said and I repeat: his work was wasted by others close to him, who did not follow his line. I'm not here to judge consciences: it is likely that these his advisers thought that maybe he did not know enough about the situation, he was unable to pursue the right strategy. In any case, these people have not implemented what Benedict XVI has established as the guidelines for the Church in China. Saying "others" I mean people in the Vatican, but also those outside who, without the help of the Holy See, would not have done so much damage. It is a very unpleasant situation, although it shows another aspect of the personality of Benedict XVI: he is absolutely firm in dealing with the truth, but is very respectful of the people around him, very - perhaps too - polite: gentle man, who never uses force. This is not a weakness, it is the other side of one of his great merits, kindness, respect, mercy, the exact opposite of how he has often been depicted (the "conservative", the "panzer", "the 'inquisitor", etc. ..). I too at times was impatient and I felt that he was overly condescending. In recent years I have continued to emphasize this point because in China the people are very simple and easily identify the Holy See with the Pope. Instead it must be said that much of what has been done in China, is not always attributable to the Holy Father. What influence have the Letter and the Commission on the Church in China had? The Letter is of great importance even today: firstly it is a document and this remains, and we can refer to it later in life. I hope the new Pope will start again from this Letter. It is written by Benedict XVI, although with the participation of many people. And it showed his clarity in truth, as well as his mercy and kindness. There is a perfect balance between simplicity and openness. This balance has been disturbed by a manipulation in Chinese translation and a tendentious interpretation. With regards the Commission, I think that an immense opportunity has been squandered. How is it possible that an assembly of 30 people, in an annual plenary meeting of three days, has been thus thwarted? Consciences need to be examined if we are to really understand why this organism did not work ... It signifies that something is not working within the Holy See. Serious study is needed to make this Commission function effectively. Of course, it is advisory in nature and the Pope has the last word, but let the Pope have really that last word! Sometimes I had the impression that the heads of department directly advised the Pope on the policy to follow and gestures to be made, by-passing the valuable and, sometimes unanimous advice of the Commission. From the outset, in my opinion, the wrong strategy has been pursued, the stragety of compromise at all costs with Beijing. Once, in front of the Holy Father, I said to him that they were following a compromise at all costs. He corrected me: "Well, perhaps not quite to the bitter end, but it is a question of degree." We could then say that sometimes they exaggerated, ceding under pressure, thinking that this was the only way for the Church in China to survive. In this way, instead of encouraging a firm stance, subjection was encouraged. Of course, the bishops in China are facing a wall and powerful pressures, but the ones who can speak freely, we must say the right things, encouraging witness to the faith. The Pope himself, faced with events in China, always referred to the "courage." Instead, those around him, spoke of "compassion", "understanding", "patience", exaggerating and ceding ground well beyond any acceptable limits, against the majority consensus of the Commission. Compassion is necessary, but also respect for the truth and for the doctrine of the Catholic faith. As for the truth, we can base our conclusion on the information we receive from many faithful and priests in China, the pars potior, the best part of the Church in China, who belong neither to the radical nor liberal fringes. The faithful, who still nourish a sense of the Church - not only the underground faithful, but also those in the official church - suffer deeply from this attitude of compromise. It would be worthwhile to translate all these complaints posted on the internet from Christians in China, a people groaning from the ambiguities that dominate bishops and opportunists. We are facing an enemy that not only damages the Church, but China too, our motherland. They are government representatives and Church figures who indecently pursue their own interests, enslaving the bishops of the official Church with enormous pressures; leading them by the nose; forcing them to participate in illegitimate ordinations, making alliances with the worst elements. I have a deep rooted suspicion: if one day the supreme leaders of China decide to take a closer look at the work of these their representatives, they will discover horrors and very dirty things. What hope is there for the Church in China? A few days ago, the Foreign Ministry spokesman Hong Lei, gave "advice" to the future Pope, saying that the Vatican "should not interfere in the internal affairs of the Church" and that it must break relations with Taiwan. For me, the Holy See must ignore these catch-phrases that China has been rolling out for decades. Hiding behind these statements is their shame because the Chinese leaders themselves are primarily responsible for having destroyed dialogue and trust. Not only in the past, but also recently. They always have to have the last word and when the Holy See could no longer bend to further compromise, they passed to bullying. It is time for China's leaders to show a minimum of sincerity. Unfortunately, even now there are people among us who feed on illusions, saying that perhaps, with the new leadership - that takes power in March - there will be new possibilities. Of course, we have to hang on to a little 'optimism. When, like now, new leaders are about to assume the reigns, we must give them a chance, but we also have to be realistic: we must denounce a truly horrible situation to these leaders. For me, the more I see of the new leader, Xi Jinping, the more I begin to lose hope. When he visited Guangdong in the south , he spoke of preventing what has happened in Russia: in giving even a little, you risk losing the power you have gained. This means that he still thinks in terms of the Party dictatorship. Instead, in Beijing he scolds his closest collaborators, warning them that if they are not honest and do not change and reject corruption, they could lose power. This means that he has the perpetuation of the Party's grip on power in mind. For me this is impossible, the Party is now so corrupt that without the participation of the people, it will never cleanse itself. Without a minimum of democracy, it is impossible for the Party to heal. Similarly in the official Church, especially among its leaders. But I have great confidence in the people and priests who despite being disoriented - under bishops unworthy of the name - accept to suffer, to go to prison for the faith and continue to evangelize. For me, these people are the ones who are saving the faith in China. Unfortunately, even in this case, the Holy See was too careful, it did not throw the full weight of its support behind his choice, opting for a policy of prudence and moderation. And we have lost an opportunity to help other bishops in China: while Msgr. Ma is deprived of liberty, they - especially the leaders of the so-called Chinese Bishops' Conference - are carted around in blue cars at the expense of the Party, to eat and drink at banquets, in exchange for obedience to the Party in making gestures against the Pope. The Committee of the bishops who condemned Ma Daqin was chaired by the Director of Social Administration of the Religious Affairs Office, Wang Zuoan. The very man afraid to stand up for his decisions, who instead hides behind the Church and the bishops, using them as puppets. In fact, and this is a source of true sorrow, through him, an atheist Party manages the life of the Church and of all religions. The example of Card. Casaroli, who in relations with the USSR and Eastern Europe not only admitted a "modus vivendi", but a " modus non moriendi " compromise to keep the Christian communities alive. Editor's Note. - See: AsiaNews.it, 10/12/2012, Xi Jinping visits Guangdong as police violently break up protest 23/01/2013 Without democracy, Xi Jinping can not defeat corruption. Editor's Note - See: AsiaNews.it, 23/01/2013 Without democracy, Xi Jinping can not defeat corruption.